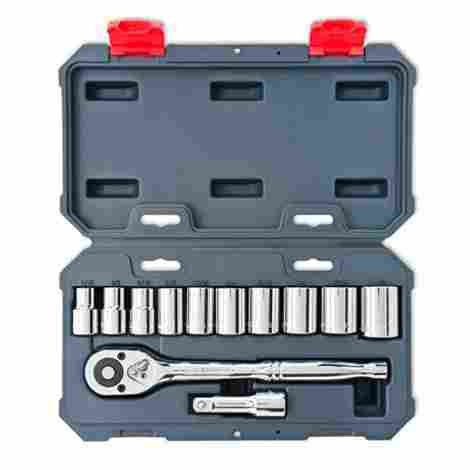 We can safely say that every garage needs a good socket set in it to help make up the perfect suite of tools. Whatever job you might be starting, it’s certain you will need a socket wrench at some point to get it done. You may have a nice accumulation of hand tools going, but a few more will make the difference between an pleasant, easy time in the garage, or a session of knuckle-busting frustration. One of those frustration eliminators is a good quality set of sockets and matching handles of the appropriate size for the task at hand. And, if you’re like us here at Drivrzone, you just like the feel of a sleek, well-made tool in your hand. Our first choice is the Crescent CSWS10 socket set in the handy 3/8 inch drive size. It includes metric sockets from 7 to 19 mm in size, and SAE sockets from 1/4 to 7/8 inch. Bonus additions include 3 and 6 inch extensions, a spark plug socket, and a universal joint adapter. The entire set comes in a handy storage case. Our top-rated set contains almost everything you need for almost any job. The set starts with a 72-tooth ratchet handle with a smooth ergonomic shape. The 72-tooth count means you only need to turn it a very slight rotation (about 5 degrees) before turning back and engaging the ratchet action, perfect for working in tight quarters in modern vehicles! The smooth handle is easy on your hand when apply the force needed to loosen reluctant nuts. The nice range of both metric and SAE sockets mean you will have everything you need right at your fingertips. And, great news! A selection of deep well sockets, which fit over longer bolts, is also included! The Crescent CSWS10 socket set is manufactured from strong chrome vanadium steel with mirror polish nickel-chrome plating for corrosion resistance and long life. The set includes not just the handle and sockets, but 3 and 6 inch extensions, handy for reaching into and around engine and body components. Also included is a spark plug socket for removing and replacing, well, spark plugs. A universal joint that eases off-center wrench applications is also yours. The entire set is contained in a fitted plastic case to keep your shop organized! This set is moderately priced, yet its quality and completeness put it at the top of our list. The average do-it-yourself mechanic might find this is all they need for many years of routine vehicle maintenance. Keeping your car in great condition and following the recommended service intervals maintains its value, reliability, and safety. Doing it all yourself saves money, so why not invest in a nice set of tools and enjoy yourself? The Crescent CSWS10 socket set represents a great start or a great addition to your garage. The Craftsman 9-35469 38-piece 3/8 inch drive socket includes SAE Sockets from 1/4 inch to 7/8 inch, metric sockets from 8mm to 19mm plus 11 additional deep sockets. A nicely styled ratchet handle and two extensions round out the set, packed in a blow-molded plastic case. Craftsman tools are known for their quality, backed up by a lifetime free replacement warranty for most hand tools. This set is no exception. While you are careful with your tools, you never know what kind a mishap could befall you or your tools. This Craftsman set’s universal design allows it to work on six different types of fastener, and has high-contrast markings that clearly show the size of each individual socket. The 15 x 10 x 3 inch case keeps the 38 chrome-vanadium steel pieces conveniently ready at your fingertips. This set is a strong contender at number two on our list. 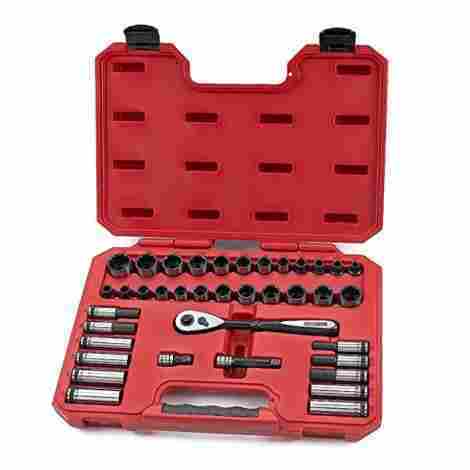 This Craftsman socket set includes deep sockets from 1/4 to 1/2-inch SAE sizes and metric sockets of 8, 10, 11, 12, 13, 14mm in size. Deep sockets are important for fitting over longer bolts that may be encountered. Having a range of sizes available near at hand keeps those garage or even household chores from becoming nettlesome. Save time and energy with the Craftsman socket set! This Craftsman socket set is a little more expensive than some, but the world-renowned quality and unmatched warranty will let you enjoy them without worrying about wear and tear. The finish and workmanship is excellent, and you’ll be well pleased with this set. Why not spend just a few extra dollars for what almost everyone says is the best? We don’t know about you, but sometimes we just sit in the garage and look at our tools. They’re almost works of art with their fine finish and eye-pleasing form. This budget socket set by EPAuto comes with a standard 3/8” drive handle, SAE sockets from 5/16 to 3/4 inch, metric sockets from 8 to 19 mm, and deep sockets in all the same sizes. 3- and 6-inch extensions, a universal joint, and a handy case round out the set. Our third choice and what we consider the best value is this EPAuto 45-piece set. It’s significantly less expensive than other socket sets, yet still contains a good range of socket sizes, deep sockets, and extensions. For the home mechanic on a tight budget, this set may be just what you need. It’s a great balance of utility versus quality. You can’t go wrong with this particular set; just think how good it will look in your garage! The extensions are nicely knurled, making them easy to hold on to and turn by hand. It’s not unusual to use one to start spinning a nut on a bolt by hand, and the good grip allowed by the knurling helps make that an easy task. The sharp markings on the sockets help the user spot the correct size from a distance and quickly attach it to the handle. We cannot overemphasize the importance of a set that’s easy to use, and this one is as easy as they come. Cost of this set is significantly lower than others, and that alone makes it a great value for the home shop. 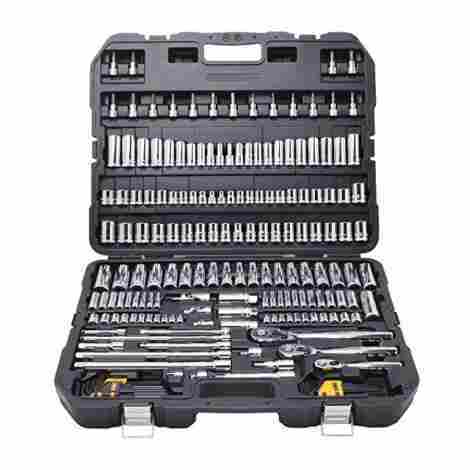 Tools are always a good investment, and this complete set at a bargain price is sure to please. Keeping up with your vehicle maintenance will ensure your family trips are safe and incident free. This socket set will help you reach that goal on a budget. This set is where we make the jump to 1/2 inch drive sets. 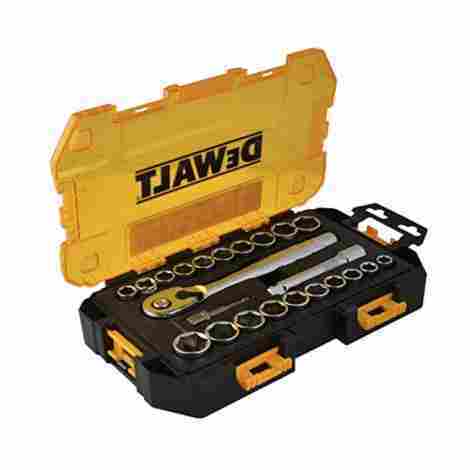 The DeWalt DWMT73813 includes a 1/2 inch drive 72 Tooth Quick Release Ratchet and 1/2 inch drive 6 point SAE Sockets. Completing the set are a number of metric sockets and a 5-inch extension. Our fourth entry in the Best Socket Sets list is the DeWalt DWMT73813 1/2 inch drive set. We try to feature a number of options in our lists, and though the smaller 3/8 inch drive sets are near universal, sometimes the job just needs a bigger, tougher tool. This Dewalt socket set is it. The larger, longer ratchet handle allows you to apply more torque with less chance of breaking a tool. This set includes 6-point sockets which have a larger gripping surface contacting the bolt, reducing the chance of rounding its corners. The SAE sockets included range from 7/16 to 1 inch, and metric sizes from 13 to 24 mm. A 5" extension rounds out the set. There isn’t a whole lot more you could ask for in a good ½-inch drive set. For the quality and value of this set, you’ll be surprised at the reasonable price. It would make a fine addition to your tool chest, and it comes, of course, in its own case. If you need to add the additional capability of a ½ inch drive socket set, you’ll like this one. While the price is within most budgets, it still features a tough polished chrome vanadium finish. DeWalt also offers a lifetime warranty, giving you additional peace of mind. 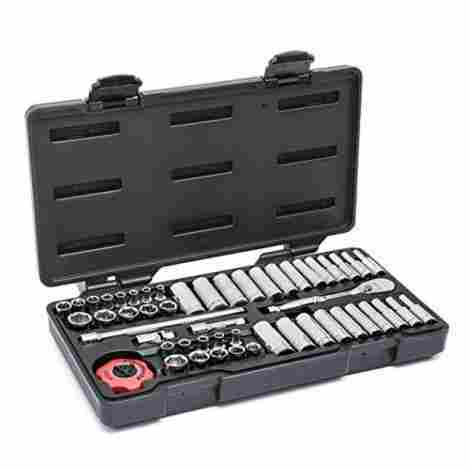 The Crescent CSWS11 12-Piece 1/2-inch drive socket wrench set is a back-to-basics set from quality manufacturer Crescent. It includes the fitted case, a 1/2-inch drive rounded ergonomic handle, 10 sockets in SAE sizes, and a 3-inch extension. The fifth entry on the list, the Crescent 1/2-inch drive set is just the basics. A hefty 1/2-inch drive handle, coupled with a set of SAE sockets from 7/16 to 1-inch in size give you what you need when you need it. We haven’t mentioned it before, but one of the great things about socket wrench sets is they are easily expandable. Any 1/2-inch drive socket from any maker fits anyone else’s handle. You can start with this, and expand to metric sizes when you need them! This socket wrench set features everything you’ve come to expect in a quality outfit. Manufactured of chrome vanadium steel, all parts receive nickel-chrome plating for long wear. The mirror finish insures easy clean-up and a nice appearance. The included case keeps the parts together and always at the ready. The basic nature of the set keep its cost low while keeping the quality level within reach. Easy expandability lets you move up when you need it. Crescent hand tools come with a lifetime warranty against defects in material and workmanship. 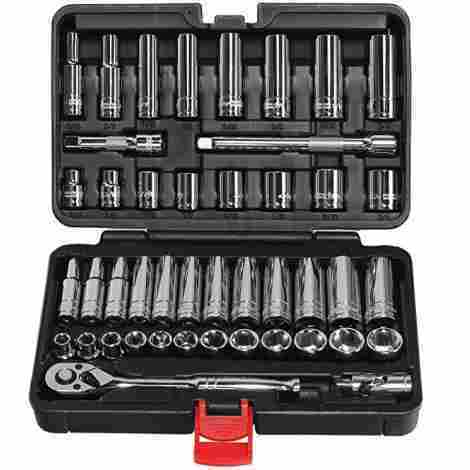 For the attractive price of this set, you can have a fine set of tools in your hands. And isn’t that why we’re here, to get the best possible tool into your hands? This Tekton 1/2-inch drive set has it all! Every metric and SAE size from 3/8 to 1 inch and 10 to 24 mm are included, both in normal and deep lengths. Two extensions, a universal joint, a breaker bar, and an attractive bright red case round out the set. The Tekton 1/2-inch drive set has everything you need right out of the box. A wide range of socket sizes, both SAE and metric, in both regular and deep sockets are included. An extra-long 10-inch extension brings those larger jobs in reach. A special addition called a breaker bar, 18 inches long, allows you to apply lots of torque to stubborn bolts without risking the ratchet mechanism of your standard handle. Breaking a rusty bolt loose is one of the challenges of routine garage work, whether it's on your car, your motorcycle, of your lawnmower. You will encounter them on nearly every job. Be ready with this beefy set. Rolling in at number 7 is another set from Tekton, the 1/4-inch drive 13001. This set is the first quarter-inch drive set on our list. It has every SAE socket size from 5/32 to 9/16 inch and metric from 5 to 14 mm, in both regular and deep lengths. The handy smaller size makes it great for small jobs and tight spaces. Here we have a pocket-sized powerhouse! This 1/4 inch drive socket set is very complete, and even includes a couple of things not seen in other sets: a screwdriver bit adapter, and a screwdriver-style handle. The bit adapter is very handy to get into tight spaces and use the ratcheting action of the wrench to remove or replace screws, using any kind of removable bit you have: Phillips, regular, Torx, you name it! The screwdriver-type handle accepts the sockets, and makes for quick loosening or tightening of small nuts and bolts. Each socket is designed with a 6-point design that holds tight to the flat sides of fasteners, not their weaker corners, preventing round-off. The smooth 72-tooth ratchet isn’t limited by tight spaces, needing just 5 degrees of rotation to operate The set is made from chrome-vanadium steel and protected by a mirror bright chrome finish. It's going to look as good in your garage as that fine automobile you work so hard to maintain in pristine condition! The cost of this socket set is moderate, considering its features. If you are contemplating adding the versatility of a 1/4-inch drive socket wrench set to your arsenal, you can do it with this one without breaking the bank, or feeling like you need to add extras. 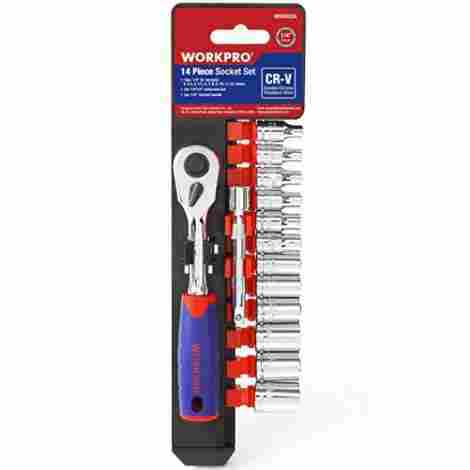 The WORKPRO 14-Piece 1/4-Inch Drive Quick Release Ratchet and Cr-V Metric Sockets Set is as basic as it can be. It includes the ratchet handle, and metric sockets in 4 to 13mm sizes, including 4.5 and 5.5mm. This little set packs a lot of capability in an inconspicuous package. The small, inexpensive 1/4-inch drive set has a nice padded handle for comfortable use, and a good assortment of the small metric socket sizes. No SAE sizes are included, but as we mentioned before, any brand will fit any handle of the same size, so you can easily expand it if need be. If you need a place to start, or you've already accumulated some tools but need the 1/4-inch drive size to work in a small space, this would be a great choice. Need a stocking stuffer for that wrenched in your life? How fun is this? It's just the ticket. One nice feature of this set is its padded ratchet handle. Using a tool like this all day can leave you with tired, sore hands, but the padded handle seen here will alleviate that problem. This is a feature not always seen on even more expensive sets, so it’s good to see it here. This set comes in at a very low-cost relative to some others. For what it is, it is very attractively priced. While it may not include a case, it has everything you need to get those small jobs done quickly. And isn't that what we are about in our garage, getting things done cheaply and quickly? 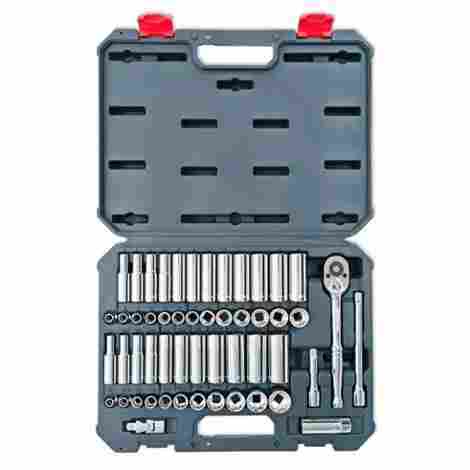 The GearWrench 80300 Socket set includes the ratcheting handle, 3/16"-9/16" SAE, and 4mm - 15mm metric sockets, two extensions, and a unique 1/4-inch drive thumb wheel ratchet. A solid plastic case brings it all together. The GearWrench 84-tooth ratchet reduces the swing required to only 4.3 degrees. Its slim head is 21% thinner than the competition, perfect for working in ultra-tight quarters. These advanced features provide even more of what you want in a 1/4-inch drive socket wrench set. The range of both SAE and metric, regular and deep sockets leave you wanting for nothing when it comes to purchasing this set. The price is moderate, but you’ll never feel like anything was left out. This is a pricier version of the 1/4-inch drive sets, but its completeness, and the unique engineering of the slim, 82-tooth handle give it excellent versatility and first-rate capability. You’d buy it for working in those small places, and this set gives you the most for your money in that regard. This set has it all. Complete sets of sockets in all three standard drive sizes: 1/4 inch, 3/8 inch, and ½ inch! Extensions in each size, a set of hex bit sockets, sparkplug sockets, universal joints, and as an added bonus, both SAE and metric hex wrench sets. This set made its way on to our list because of its completeness. Buy this, and you will need almost nothing else, ever, in the way of socket wrench tools. All the usual drive sizes, not just one. Regular and deep sockets in a wide range of both SAE and metric sizes. The only drawback to this set is its price, but it’s likely cheaper to buy it all in one shot than bit by bit. This set is 37 pounds of DEWALT quality chrome vanadium steel. The sockets have deep laser-etched markings for easy identification. Knurled rings help in maintain form control. The directional levers are low-profile, yet still allow easy one-hand operation. All components fit neatly in the included case. This set will be the pride of your garage! This is the most expensive item on our list, but as we mention above, it is very complete. All sizes and drives are represented, you will want nothing else. From the largest job to the smallest, you will have the socket you need right at your fingertips. It may be pricey, but it is easily worth every penny. A limited lifetime warranty on these tools raises the bar even further. 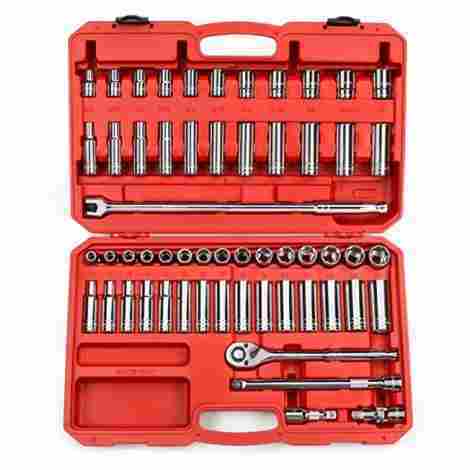 This is a socket set you will use for years. Having run down our top choices in socket sets on the marketplace, we hope you’ve seen the same thing we have: your choice is dependent on your needs. There are many options available when it comes to socket sets. The balance between quality, design and price is as important when comes to this buying decision as it is with any other. We’ve used a lot of sockets in our life, and we are here to tell you this: don’t skimp when it comes to buying tools. You may need to budget your purchases over time, but when the time comes, buy the best you can. Any of the sets on this list will give you good service for years to come. What you need today might be different tomorrow. Some of the greyer beards around our garage remember when the SAE sizes were all you needed to work on an American car. Metric wrenches were an oddity only rarely seen. Now they are a necessity. Many cars are all metric; many more are a mix. It just means you need a wide variety of wrenches in your tool chest! In selecting a tool, the first consideration is: can it do the job? If you’re pulling lug nuts off a semi truck, a little 1/4-inch drive wrench won’t do. If you’re working in close quarters behind your car’s dash, that ten inches long 1/2-inch drive wrench just won’t fit. The right tool for the right job is key. That’s why early in, we recommended the 3/8-inch drive sets as a good compromise, a middle of the road size. 3/8-inch sockets are the go-to in our garage, the first thing we reach for when we need a wrench. That represents the greatest utility, and that earns our higher ratings. Next, think about materials and workmanship. 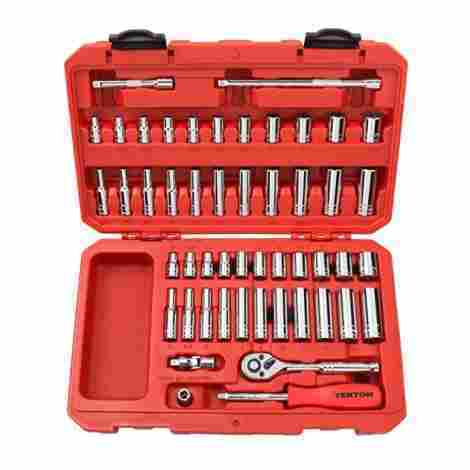 Good quality chrome-vanadium steel is the standard in socket sets, and none of the sets above are an exception. Extra plus factors include thick nickel-chrome plating for extra protection, knurled anti-slip rings for a solid grip, and large deep size markings for easy identification and selection. The little touches make all the difference. We’ve poorly-made socket wrenches seize up; we’ve had them fall apart in our hands. The ones we list above won’t do that! You’re doing your due diligence by reading this list, nice job! A good selection in socket sizes included with a set are important. The middle range in SAE and metric sets is usually well-represented, but the larger and smaller sizes less so. That can be important; it can be a dismaying feeling to be halfway through a project and find your set doesn’t include that 5.5 mm socket you desperately need. Again, it’s a tradeoff in cost versus content. Buy the best you can, you’ll be glad you did. Remember though, you can always buy individual sockets if you need a particular size and it’s not in your toolbox. Regardless of manufacturer, all these sockets are mix and match, as long as you have the same size drive. We have an odd one, a 1/2-inch drive 1-1/4-inch socket that we needed for a particular job; it’s only been used three times in a decade, but when it’s needed, it’s invaluable. We never gave much thought to it, after all a ratchet is a ratchet, right? Not so much! It seems there are variations after all. Padded handles, 72-tooth (or more) mechanisms, rounded, pear-shaped handles, thinner low-profile heads, and low-profile directional levers are all on our list. 72-tooth heads need only 5 degrees of rotation to engage the ratchet mechanism. That should be your minimum requirement, and all of those on our list meet or exceed that. The case a set comes with an important consideration. Maybe you have one of those impressive rolling mechanic’s tool chests with all the nice drawers in your garage, and you won’t keep your sockets in their own case anyway. Or you don’t, and keeping your whole set together in one kit will be important. We believe a case is usually better than none, and our choices reflect that. It keeps the garage neat, too, and we love a neat, attractive garage, don’t you? A smooth mirror finish means your tools are easy to clean. A quick wipe with a shop towel and they’re ready to put away. A thick nickel-chrome plating means they are attractive and durable. We looked closely at the finish of each of these sets in our consideration. A finely machined and well-plated socket just has that indefinable panache that a lesser example lacks. Q: Just what does “SAE” mean anyway? A: SAE refers to wrenches (and the bolts nuts they are designed to turn) that are sized in the US scale of inches. SAE actually stands for the Society of Automotive Engineers, the trade organization that specified the standard sizes, pre-metric conversion (for most of the world, anyway). When you see SAE, think sizes like 3/4-inch, etc. Of course, the modern Society of Automotive Engineers is not rooted in the past, and inch measurements! In the modern day of electric and hybrid vehicles, who would expect that? Not us! But the inch measure nuts and bolts are everywhere, so the well-equipped garage is ready for anything. Q: What is a six-point versus a 12-point socket? A: When you look in the business end of a socket, you will see, in a six-pointer, it is shaped just like the six-sided nut it’s supposed to turn. A 12-point socket has twice the number of “points” to admit the hex head nut or bolt. A 12-point socket is quicker to use, but has less surface bearing on the bolt. It’s a lot easier to see than describe. Q: What do extensions do? A: Extensions go between the ratchet handle and the socket. It just provides extra length if you need it for extra reach down into a tight space. You can stack extensions if you need to. Many sets come with a three-inch and a six-inch extension, if you need more, combine them to give a nine-inch reach. Theoretically, you could keep combining them for many feet, but there is actually a little play in each joint, so that’s not practical. Combining a couple is, though, and it’s done all the time. Q: How do you preserve your tools so they last a long time? A: First, buy good quality tools, with good workmanship and an excellent finish. This will help you keep them clean. Second, always use them for their intended purpose. Don’t use your good ½-inch drive ratchet handle as a hammer, for example. It’s big, it’s solid, and it might work very well, but it will not help its longevity! Third, put them away in a safe place, out of the elements. If your sockets are rolling around the back of your pickup truck exposed to rain and snow, they’ll soon rust and become useless. Treat them well and they will treat you well.